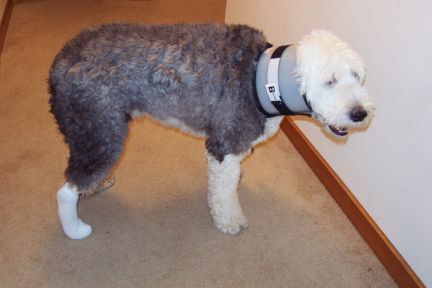 Shorts instead of an elizabethan collar - a better approach? 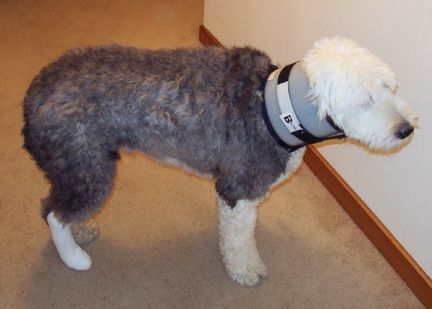 When Jake had his abdominal surgery back in about 2000, we looked to the veterinarian to supply us with a more accommodating version of the big plastic elizabethan collar (ecollar, e-collar?). He had nothing, and wasn't aware of anything !?! I recall having seen one that looked like a big soft human cervical collar, that would just prevent the dog from being able to reach around it. Funny enough, sometimes those human collars are called "dog collars", but nobody seems to use them on dogs. 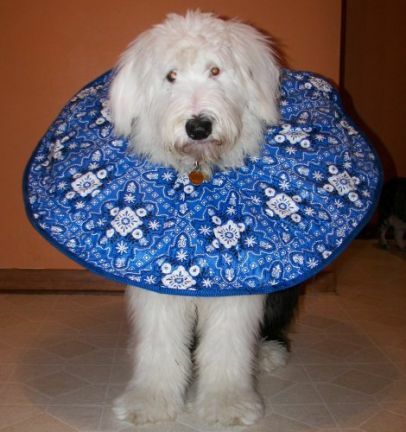 I have also seen on the web big floppy collars that go over the dog's head and make them look kinda like a daisy.. at least when it hits the walls it won't do as much damage, and won't be funneling what has to be an enormous amount of sound right into the dog's ears. None of which the vet had available for purchase. You'd think he would -- he could make a few bucks while helping his customers to further pamper their pets. But NOOOOOOOOOOOOOooooooooooooooo. Inspired by Allison ("Hendrix's Mom"), I tried shorts on Mulligan last night and today. The shorts kept falling off; We tried some flannel PJs of Joans with drawstrings, that was a bit better, but they were long legged and too long for Mullie, and they kept falling down too. I came up with a concept for suspenders, but didn't have the initiative to get that project going. Then we decided to try some "shorts" of mine, that are really bathing trunks with a drawstring. I put them on "normally" with the string at his belly; Joan came up with the idea to put them on backwards with the drawstring on his back for better access. Great idea. That springboarded me to think about tying the string to his collar to keep the shorts from falling down. It works! 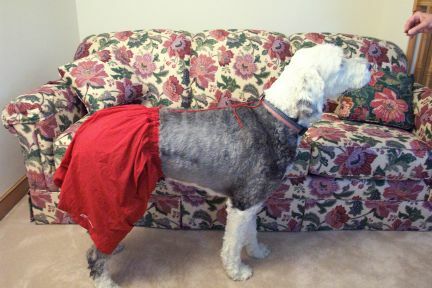 We keep a very close eye on him with this, and this solution isn't good for all circumstances, but it's preventing him from worrying a spot on his rear leg..
Perhaps the right-sized shorts with a wide elasticized band would also work without the tie up. I don't know, since I haven't tried it. Veeerrryyy fashion trendy Ron! Actually- I love the idea of shorts or a tied tee shirt to prevent licking and chewing a wound- so much gentler on the pupper, and, if you have 'em in the closet- it's free! Wow! That's a very creative idea with the shorts! You should patent it! The pair of shorts hendrix is wearing are old shorts I had from high school. I tie them tight around him and pull them real high up like Urkel. A lot of tail wagging and romping around and the shorts will slip, but we're always there to tie them tighter. I'm glad the vets idea worked! would have been a better alternative than the e collar. LOL @ the shorts.... whatever works I guess! And LMBO @ bestdogsx4... THAT is too funny!!!! He looks more like a Speedo guy to me! Its the age old question....boxers or briefs? Hey whatever works!!! Nice pose by the way!!!! All these pictures inspired me to put James's boxer briefs on Clyde just for fun. I put them on him and sent him downstairs to show James. I'm not allowed to put his underwear on the dog anymore. I wonder if a regular soft cervical collar would work. No, I think James just wants to wear his underwear. I don't think we need it right now, but it will be good to have one if needed. I don't think I'll be putting it on him just to take pictures, but if he starts worrying his sore some more, I'll put it on and grab a pic or two. Butterstotch - I almost lost my sip of soda on your comment about not being allowed to put your husbands stuff on Clyde anymore! Sooooo funny!!!!! Jill, im LMAO....did he get grossed out? Brian would have flipped!! AWW throw it in the wash, they'll be fine!!! Loosen up boys!! Its only underwear! LOL, when Annabelle went through 2 heat cycles, she got to wear shorts and feminine hygene products....LOL It worked great!! She was able to still be out with us and not get anything dirty. She also wore them after she was spayed, as Jack kept trying to clean her wound. I couldn't see how we could fit the E collars in this house....we would have everything broke. OMG...I was inspired as well to try some shorts on Guc, but after the underwear/husband story, I rethought that! My hubby already thinks I'm over the top nuts about sheepies! Never mind starting to use his clothes as fashion accessories! Can I also say that I want so many sheepies in the house that I get them confused too! LOL I love the story of Daisy and Rosco! Colleen and Gucci George=>Mommy, a pair of Daddys undies would be perfect for our walks...the deer flies couldn't bite my bum then! I know this is an old thread, but I had mentioned that I had purchased the Bitenot collar. I finally used it tonight, for a few minutes while Joan was trying to change Mulligan's bandage. He's really not as lame as this looks... he always walks a bit gingerly for a couple of minutes after a new bandage is put on. Amazing -- he just ignores it 99% of the time. He tolerated the collar extremely well. After we put it on, he didn't seem to notice it at all. POOR MULLIGAN So where did I miss the thread on what happened to him????????????????????????????????????? Where did you purchase the collar? Ron I like the fashion. If you have a large size in blue I'll take two of them. Do you charge extra for silk? I'm with Ginny - what happened to Mulligan?? It looks like Mulligan is suffering from whiplash with that brace on. I'll make a post about Mulligan's ills elsewhere. Here's another version. This should be a lot easier on the walls, and should eliminate an e-collar's aural amplification problems for your dog too. Thanks for the pic, Pam! I bought that collar for Ty (a much smaller version) after his surgery in September, IT WAS A DISASTER!!!!!!!!!!! It looked cute and appeared very comfortable but the minute my back was turned he EASILY got past the collar and promptly chewed half his stitchew out. The flexiblity of the collar makes it easy to reach the backend, it might work for a front shoulder or chest wound but I would not trust it for the back end.